This is FRESH AIR. In the years since Ella Fitzgerald would have turned a hundred, there have been many tributes to this great jazz icon. But music critic Lloyd Schwartz thinks the best of the recordings released in her honor just squeaked in for that centennial year. Here's his review. ELLA FITZGERALD AND LOUIS ARMSTRONG: (Singing) The snow is snowing. The wind is blowing. But I can weather the storm. What do I care how much it may storm? I've got my love to keep me warm. LLOYD SCHWARTZ, BYLINE: For Ella Fitzgerald's 100th birthday, I was hoping that her three albums with legendary trumpet player and singer Louis Armstrong might be reissued as part of the festivities. But what was released was even better than I'd hoped. 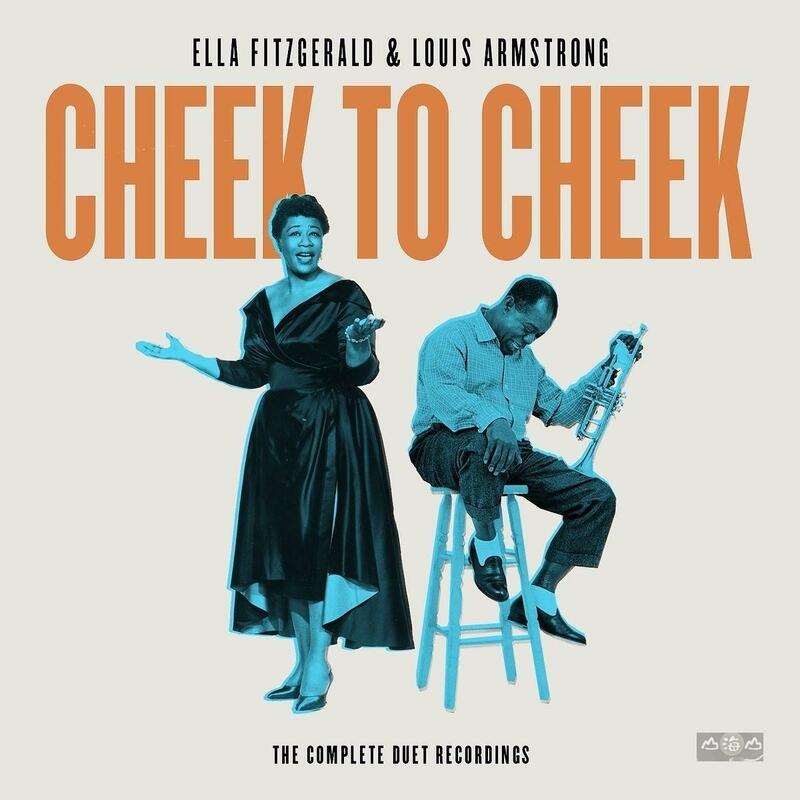 Not only have all three albums been reissued, but all of the recordings they ever made together are now part of a four-CD set called "Ella Fitzgerald & Louis Armstrong - Cheek To Cheek: The Complete Duet Recordings." Their three albums - "Ella And Louis," "Ella And Louis Again" and an album of excerpts from "Porgy And Bess" - were recorded in 1956 and 1957, but they actually started to record together 10 years earlier. There's absolutely no reason Ella's warm yet ultra-cool voice should blend so effortlessly with Louis' gravelly growl. They're the opposite poles of jazz singing. But it works. One of their singles from 1950 with Sy Oliver and his orchestra has made me happier than anything else I've heard all year. Armstrong's eloquent, speaking trumpet doesn't hurt either. SCHWARTZ: But it's the vocals that fly me to the moon. FITZGERALD: (Singing) Stars shinning bright above you. Night breezes seem to whisper I love you. Birds singing in the sycamore tree. Dream a little dream of me. Say nighty night and kiss me. Just hold me tight and tell me you miss me. While I'm alone and blue as can be, dream a little dream of me. LOUIS ARMSTRONG: (Singing) Stars fading, but I linger on, dear. FITZGERALD: (Singing) Oh, how you linger on. ARMSTRONG: (Singing) Still craving your kiss. FITZGERALD: (Singing) How you crave my kiss. ARMSTRONG: (Singing) Now I'm longing to linger till dawn, dear, just saying this. FITZGERALD: (Singing) Give me a little kiss. Sweet dreams till sunbeams find you. Sweet dreams that leave all worries behind you. But in your dreams whatever they be, dream a little dream of me. ARMSTRONG: (Singing) Fading, but I linger on, dear, still craving your kiss. ARMSTRONG: (Singing) Yeah, I'm longing to linger till dawn, dear. ARMSTRONG: (Singing) Just saying this. FITZGERALD AND ARMSTRONG: (Singing) Sweet dreams. FITZGERALD: (Singing) Till sunbeams find you, keep dreaming. ARMSTRONG: (Singing) Got to keep dreaming. Oh, yeah. FITZGERALD: (Singing) Leave the worries behind you. FITZGERALD: (Singing) You've got to make me a promise. FITZGERALD AND ARMSTRONG: (Singing) You'll dream. Dream a little dream of me. SCHWARTZ: The song, dating back to 1931, has lyrics by Gus Kahn and music by Fabian Andre and Wilbur Schwandt. I was surprised to discover that its very first recording was by band leader and '50s sitcom star Ozzie Nelson. The first two of the Ella and Louis albums include classics by George Gershwin, Cole Porter and Irving Berlin with a lovely selection of songs introduced by Fred Astaire like "A Foggy Day" and "Cheek To Cheek" along with a collection of lesser-known standards and non-standards by, among others, Hoagy Carmichael, Kay Swift, Harold Arlen and Andy Razaf. Jazz greats like Oscar Peterson, Buddy Rich, Herb Ellis and Louis (ph) Bellson turn up in the various bands. Some of the tempos are surprising, and it's also a treat to hear the most obscure verses of familiar songs. The set also features a live performance from a Bing Crosby radio show with Crosby joining in, two numbers recorded at a Hollywood Bowl jazz concert in 1956 and even a bunch of outtakes from their recording sessions. Their album of songs from "Porgy And Bess" includes some of their most moving work with Armstrong's extraordinary Porgy and Fitzgerald singing songs written for several different women characters. Here's their jazz-infused version of "Summertime." FITZGERALD: (Singing) ...And the living is easy. FITZGERALD: (Singing) Fish are jumping, and the cotton is high. FITZGERALD: (Singing) Oh, your daddy's rich. FITZGERALD: (Singing) And your ma is good looking. ARMSTRONG: (Singing) Your ma, (scatting). FITZGERALD: (Singing) So hush, little baby. FITZGERALD: (Singing) Baby, don't you cry. FITZGERALD: (Singing) Don't you cry. SCHWARTZ: According to the Ella and Louis liner notes, their first album was recorded in only one day and mostly in single takes. Everyone enjoyed making it so much, Fitzgerald said years later, it never seemed like we were really recording. Another great jazz trumpeter, Dizzy Gillespie, was once asked to describe Ella Fitzgerald's talent. Man, he said, you can't see that far. DAVIES: Lloyd Schwartz teaches in the creative writing MFA program at the University of Massachusetts Boston. His most recent book of poems is "Little Kisses." He reviewed "Ella Fitzgerald & Louis Armstrong - Cheek To Cheek: The Complete Duet Recordings" on Verve. DAVIES: If you'd like to listen to interviews you've missed, like my interview with former Major League Baseball first baseman Keith Hernandez or with Ben Rhodes about working in the Obama White House, check out our podcast. You'll find lots of interviews. FRESH AIR's executive producer is Danny Miller. For Terry Gross, I'm Dave Davies. ARMSTRONG: (Singing) A fine romance, my dear Duchess, two old fogies who need crutches. True love should have the thrills that a healthy crime has. Oh, we don't have the thrills that the march of time has. (Scatting) A fine romance, my good woman, my strong, aged in the wood woman. You never give the orchids I sent a glance. No, you like cactus plants (laughter). This is a fine romance. Transcript provided by NPR, Copyright NPR.